Didn’t it spawn the baja? 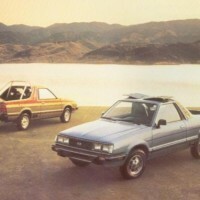 I have had 2 Subaru’s, the first one being my first car, an 81 GL Hatch. FWD only, and could still get it more places than alot of 4wd trucks if only because I drove the hell out of it and it wouldn’t break. 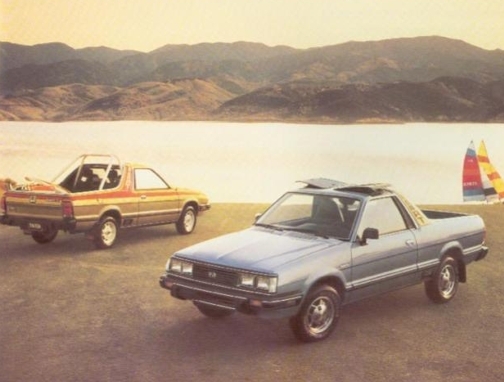 Several years later I bought an 86 BRAT with T-Tops, rear suspension was a rusted out mess, but it still never let me down once. Again, drove the hell out of it, and the 4wd let me get into even more places that I should not have been able to get into. I peruse Ebay, Craigslist, etc every now and then looking for the holy grail I almost bought a few years after that. It was brown, it was an 88, the last year I believe, it had T-Tops, and a TURBO! Ahh…the days when piling people un-tethered into the back of a pick-up was perfectly ordinary manner of transport. You were only limited by the size of your pick-up’s bed (and hauling capacity if all of your friends were particularly heavy). I thought the plastic seats in the BRAT were cool (I was a lot younger then). Seat-belts! Shmeat-belts! – They’re over-rated anyway! The seats were plastic so they would stand up to elements better.